Donald Trump’s campaign for the presidency has sparked no shortage of outrageous quips and soundbites, like the memorable line from Latinos for Trump founder Marco Gutierrez, who warned that “taco trucks on every corner,” would swarm the nation if Hillary Clinton wins the election on November 8. Taking that hypothetical and largely beautiful vision for America’s taco landscape to heart is the United States Hispanic Chamber of Commerce. The group is planning to register would-be American voters at taco trucks, using the mobile taquerias for an initiative called Guac The Vote. The USHCC is basically an affirmation of Gutierrez’ worst nightmare: It’s a direct affront to much of the Trump campaign’s anti-immigrant bluster, in addition to the candidate’s affinity for devouring Taco Bowls high up in his guarded Trump Tower lair. Javier Palomarez, president of the USHCC, told NBC News that while his organization has endorsed Clinton, Guac The Vote is committed to a bipartisan framework. 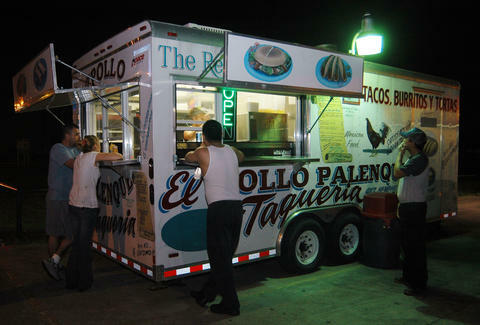 The taco trucks are revving up their engines soon, and Palomarez says, "we are hoping in the next two weeks it will be in full swing." If Guac The Vote succeeds at creating a dense infrastructure by election day, the organization hopes to park a taco truck outside every polling station across the country -- a coup for taco lovers everywhere, and a boon for democracy. Sam Blum is a Staff News Writer for Thrillist. He can be found discussing the finer points of tacos on Twitter @Blumnessmonster.